There�s one discographic novelty here. This is apparently the first recording of the Grechaninov sonata, a product of his early sixties, and a work that makes a suitable companion for the Tcherepnin sonata, written a year later, though the work of a very much younger man. This isn�t so common a sight on disc in its own right, though the Ivashkin-Tozer duo�s Chandos traversal did its profile no harm. As for the Rubinstein sonata this, rather like his Viola sonata, appears with commendable regularity, though it�s often a case of searching the smaller labels for signs of life. Apart from the high profile Isserlis-Hough on RCA you would need to look to Praga, Etcetera and other smaller labels - there are several more - for your Rubinstein. All of which makes this a decent looking option for those seeking out this repertoire. The Rubinstein is almost a case study in moderato. Each of the three movements is a moderato of some kind, modified or otherwise, and it can make for a rather undifferentiated work if the performers aren�t alive to difficulty of projection. Fortunately we have a reasonably realistic balance between instruments and the Semenov-Stegman duo plays with amiable understanding. When the piano takes over the melodic statements from the cello after the latter�s early first movement cadenza the accompanying cellistic figures are as they should be � discreet and withdrawn, not overpowering the piano. The vocalised Siciliana of the second movement is notable for piano arpeggios and scurrying cello passagework � and for Rubinstein�s gift for lyricism that takes the instrumental to the foothills of the vocal. The finale is a canny extension of the Siciliana � an extroverted and once again very vocal movement with little salon-ised gypsy themes. The Tcherepnin is his third cello sonata and is brief. It starts in media res and takes the listener by surprise. The writing is broadly Rachmaninovian and the piano writing is often more arresting than the cello line. The slow movement holds its heart � short and expressive with a contrasting central section. The piano�s chiming treble glitters with life. Once into the finale there are some bravura Lisztian moments but once more Tcherepnin disconcerts the listener by ending "in mid air". Finally, the Grechaninov Op.113 sonata. Again this is a three-movement work, rather bigger than the Tcherepnin, and rather more forward-looking. There are distinct hints of Prokofiev here, amidst the clear piano part and its Rachmaninovian chordal drive. But it�s the rather strangely titled Menuetto tragico that holds the key to this work. The melody that opens it falters and constantly re-starts � even the later broader melody in a lower register and the greater urgency of subsequent themes fails to arrest the now gruffly re-stated melody. There�s balletic and lissom Russian drive in the finale � maybe also a hint or two that Grechaninov knew his Brahms. 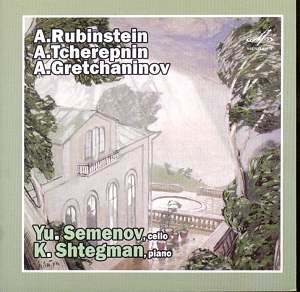 Recorded in 1997 this is a good coupling, very decently played and recorded and especially valuable for the Grechaninov.